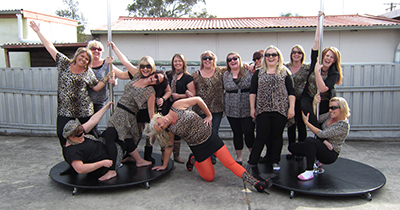 Our pole parties are unforgettable celebrations of birthdays, brides-to-be, divorce parties and groups of people looking for an exciting way to bond. Attendees should wear workout attire and bring a bottle of water. Additionally, we recommend that you don't wear hand moisturiser on the day of your party. For safety, alcoholic beverages are not allowed in our studios. Alcohol should not be consumed prior to your party. Intoxicated attendees will not be permitted to participate. A photographer is also available, at an additional cost, upon request. The Baby Bella Party runs for one hour. Designed for small gatherings of friends, workmates and/or family. It starts from the time you walk in the door to the time you walk out. Learn some cool pole moves, a simple, fun routine and loads of practice time. You will also be inspired by a performance done by your instructor! Non participants may watch for free! The Brazen Bella Party runs for one hour. Designed for gatherings of friends, workmates and/or family. It starts from the time you walk in the door to the time you walk out. Learn some cool pole moves, a simple, fun routine and loads of practice time. You will also be inspired by a performance done by your instructor! The Big Bella-licious Party runs for approximately 1.5 hours. Designed for large gatherings of friends, workmates and/or family. It starts from the time you walk in to the time you walk out. Learn some cool pole moves, a simple, fun routine and loads of practice time. You will also be inspired by a performance done by your instructor! If you organise a Big Bella-licious Party, you as the organiser, comes free! To follow us on Facebook, click here! ALL CONTENTS COPYRIGHT © 2019 Bella's Pole Studio. All rights reserved.